A nudge. A gentle push. A global difference. What is your answer to this question? Waste reducing? Energy saving? It is true that both of these are what we should do for sustainability, but what does sustainability exactly mean to YOU? Take another 10 seconds to think about your answer. Honestly, I couldn’t figure out a clear statement for that until I participated in the 2014 Nudge Global Leadership Challenge. During those three days, 30 young talents from different countries were gathered in Amsterdam. The immense topics ‘Leadership’ and ‘Sustainability’ were presented, discussed, taught, debated about, and turned upside down in a never-before-seen format. The session that impressed me the most was ‘The Board of Children’. 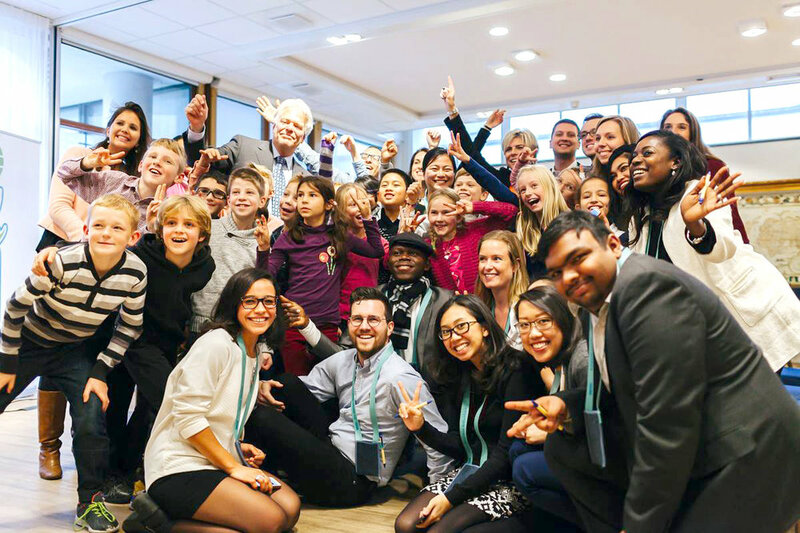 Twenty 9-year-olds of different nationalities from the International School in Hilversum joined us for an interactive brainstorming session led by Princess Laurentien van Oranje. I didn’t have any idea on how they would answer such a serious question as ‘What is sustainability?’ However, they did a great job and eventually all the participants were inspired by the kids. The answers from the kids were so simple yet marvellous. They provided us, the adult people, with great insights that were valuable. You should think from deep inside your heart. There is no right or wrong answer – it is all about how you think that matters. For me, sustainability is about being grateful and sharing. It was a great honour for me to represent China on the Nudge stage, or at least represent my generation in China. The generation was born just after the implementation of China’s One-Child policy, tagged as ‘Little Emperor’. With bad comments, it is something we cannot fully deny. It seems like we have grown up with everything ready for us and dominate all the love and attention from the family. Taking everything for granted makes people forget how to be grateful and less likely to share. I don’t only refer to relationships with people, but also with nature. It is not only the generation with lots of comments, but also the generation who is the change agent. Living on the land of China, a country with such huge territory and population, we often have concerns such as what can we do as individuals? How the contribution of an individual can influence? That’s an actual challenge, but don’t let it become an excuse. If you don’t step out, you don’t have to ask the second question. By contributing from our own level, we can at least create a micro system that enables giving and sharing back. Young people are the generation to utilise resources and systems to put all individual efforts together. I have been greatly encouraged by all these advices. Respect, and be grateful to all we’ve got. Don’t limit yourself, and ask yourself how would you like to see the world? Nudge connects people and organisations to realise bottom-up initiatives that bring positive and durable change to our society. We believe that knowledge and expertise are worth more when shared, and we facilitate this through our platform and broad network. By enabling bottom-up initiatives we aim to provide opportunities to take action that are accessible to everyone. All our activities are based on ecological, economical and social impact and can be both big and small. From terminating your phonebook subscription to co-creating with our community towards a common purpose. We believe every step counts. Nudge is a social enterprise. This is a new sustainable form of doing business. We do business to make a change. Financial return is not our primary goal, but achieving our social mission is. Nudge invites you to act and contribute to society in a positive way. A nudge. A gentle push. A global difference.